The dreaded year 2016 is almost over and not a moment too soon. Hurry up and flip the calendar before another beloved actor or musician passes over to the other side! This year wasn't all bad though. First of all, the Cubs won the World Series! Plus, I was able to consistently blog throughout the entirety of the year without any months-at-a-time hiatus. Furthermore, I was able to step up my trading game quite a bit. On that note, P-Town Tom, of the newly rechristened Eamus Catuli! 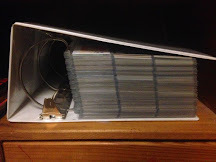 blog, managed to slip one more PWE into my mailbox before the ball drops in Times Square. He made it count too. I audibly gasped when I discovered that a card that I've long been chasing was nestled safely inside a top-loader, within this unexpected mailing. 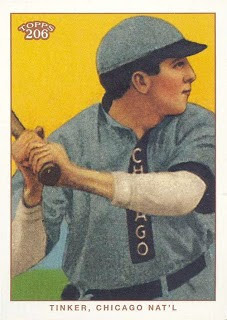 This card features a super short-term Cub from the early days of the previous century, making him a coveted target for my CATRC. Furthermore, the card upon which his mug is depicted hails from one of my favorite sets in the last fifteen years. As far as retro-themed sets go, you can keep Gypsy Queen and Allen & Ginter, I'll take Tristar Obak any day. They got so much deeper into the obscure with their subject matter. No matter how short and insignificant his time at the West Side Grounds was, his inclusion was necessary for my CATRC binder. This 2009 Tristar Obak single (and it's various parallels) are essentially the only options and I've long pined for this retro-inspired card. Pictured here with the Mattoon Giants, the Illinois-native was a hot-shot prospect in the first decade of the 20th century. 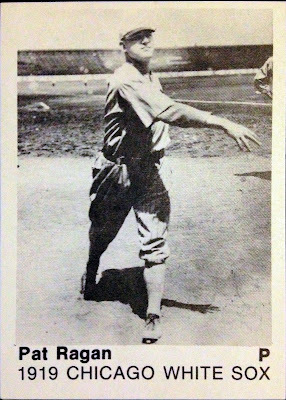 Pitching mostly for Mattoon in the Eastern Illinois League in 1907, "Slim" set the professional single season record for strikeouts, fanning 465 men along the way. Unfortunately, contemporaries agreed that his fastball was only rivaled by the immortal Walter Johnson, his control was more Rick Ankiel than "The Big Train." Several teams were tantalized by his live arm, leading to several opportunities in the Bigs. However, his career 0.79 K/BB ratio kept him from achieving his full potential. Even still, Lowdermilk managed to have a nine year career in the Majors, taking the mound with the Cardinals, Cubs, Browns, Tigers, Indians and White Sox. 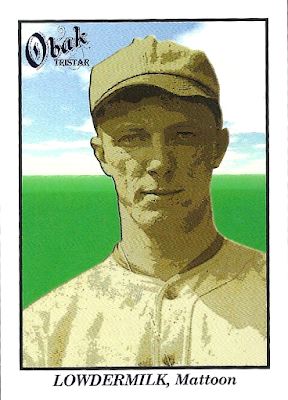 It should be noted that Lowdermilk was one of two former Cubs who played for the "Black Sox" of 1919, along with Pat Ragan (above). In fact, Grover was the only one of the two who saw World Series action, getting mop up duty in Game One (1 IP, 1 ER). That said, by all accounts, Mr. Lowdermilk was not involved in the infamous fix. 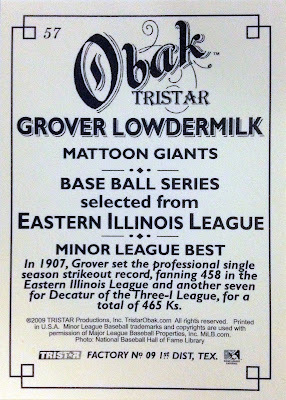 Meanwhile, Grover's stint with the Chicago NL club lasted all of two games during the 1912 season, but he was involved in a pair of notable deals featuring marquee names that Cubs fans should recognize. First, he was traded to Cincinnati by Chicago, along with the poetic Joe Tinker. Then, before ever taking the field with the Reds, he was dealt to Louisville (AA) for the fabeled "Three Finger" Brown. Talk about brushes with greatness. 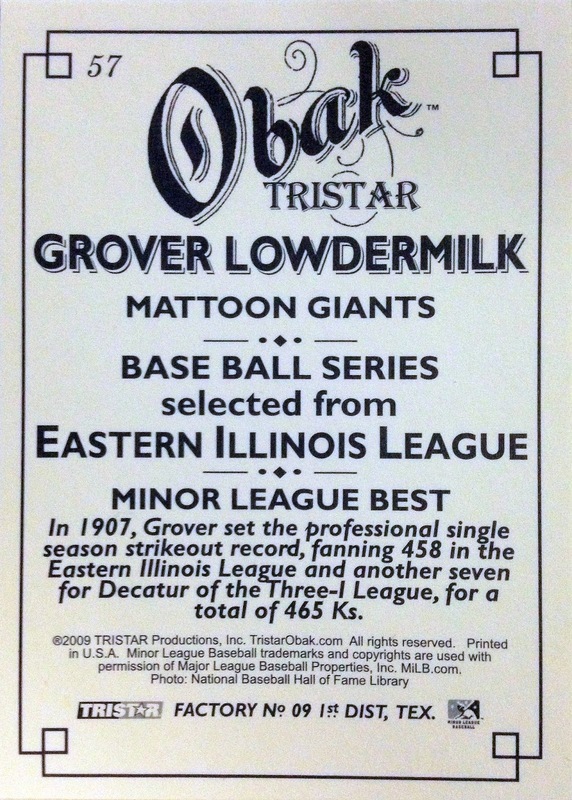 These two storied Hall of Famers were both involved in deals for... Grover Lowdermilk? Also of interest (at least to me), the Lowdermilk family line in North America extends back further in time than that of the United States. The patriarch of his clan, Jacob Lautermilch (which means "clear milk" in German) immigrated to the colonies sometime before 1750 and was a decorated hero of the American Revolution. 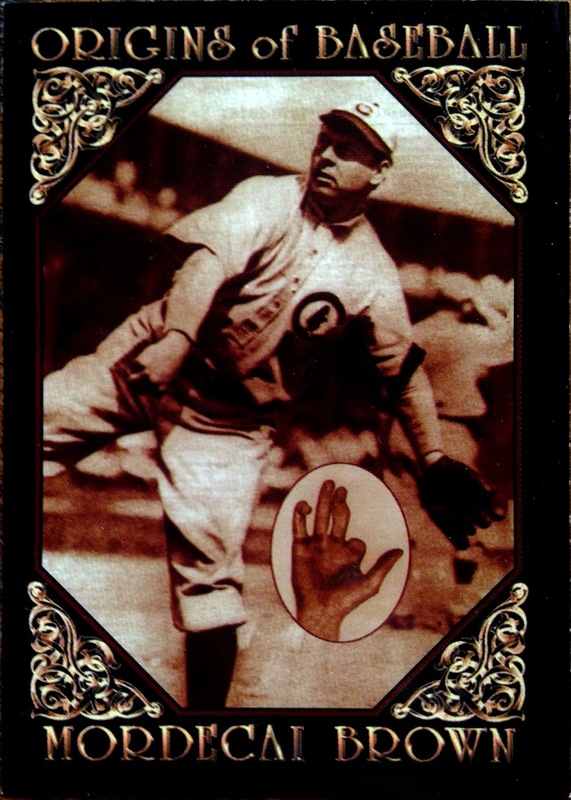 Speaking of family, Grover's brother Lou was also a skilled moundsman, briefly appearing in the Bigs as a teammate with the 1911-12 Cardinals. 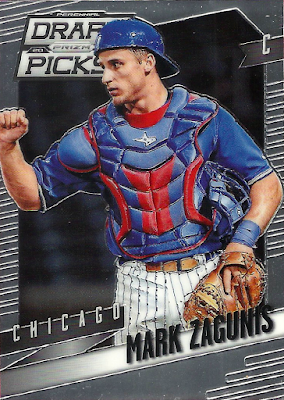 Mark Zagunis was drafted in the third round of the 2014 draft out, of Virginia Polytechnic Institute and State University, as a catcher. However, the polished college hitter was able to advance more quickly up the minor league ladder as an outfielder, making it all the way to AAA by mid-season, last year. The corner outfielder has little home run pop, but does posses gap power and a keen eye. 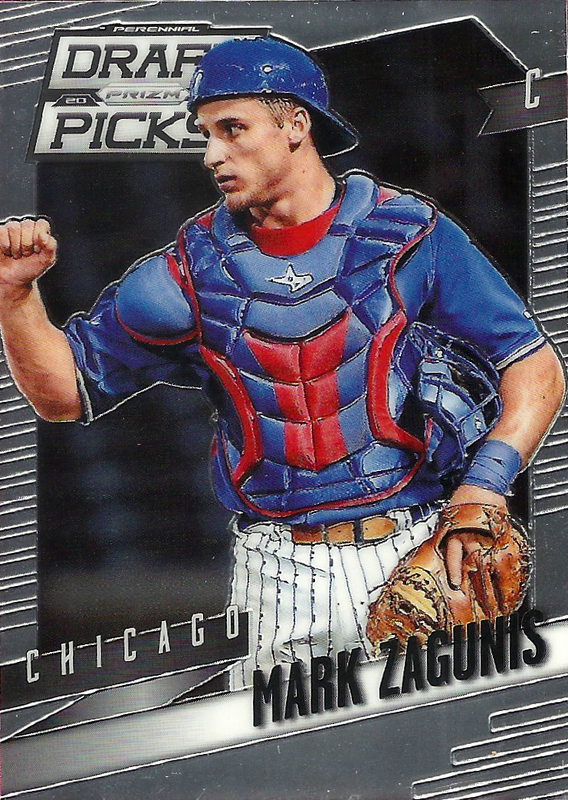 In short, Zagunis could be one of the first names called upon should an injury arise and, at the very least, should be considered for a September call-up. Tom, for one, is "...predicting (I'll) be in need of one (Zagunis card) come this summer..." for my CATRC binder. If so, this Prizm Draft Picks single from 2014 will fill the slot capably. A page from his National Baseball Hall of Fame desk calendar. 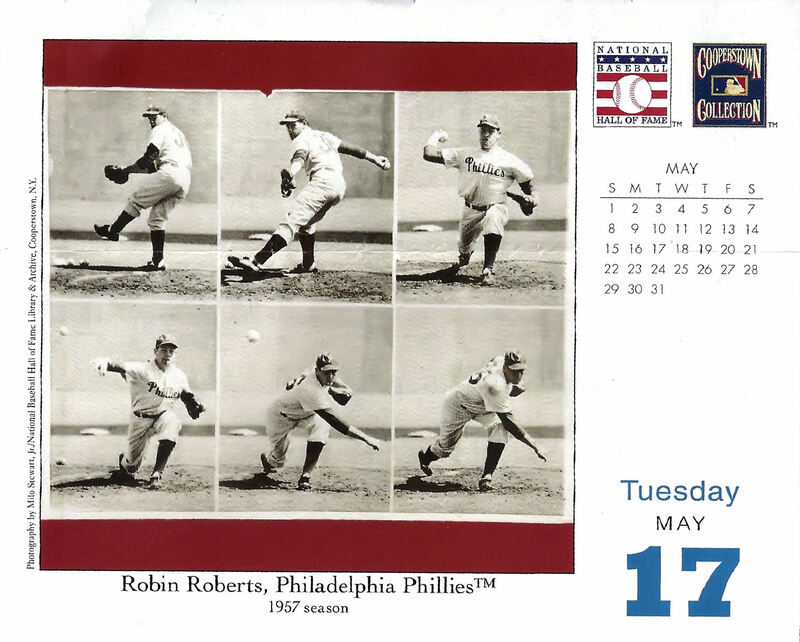 Apparently, Tuesday, May 17 of 2016 featured the pitching motion of Robin Roberts - himself a short term Cub. Perhaps I should have taken this a sign of what was to come in Tom's envelope? Slow and steady growth is the name of the game. At this point, it's getting difficult to track down new names. Thank you P-Town Tom for allowing me to close out 2016 on such a positive note. Besides the celebrity deaths, it's been a rough year politically and socially in this country and, personally, there's been plenty of stress as well. But, it's surprise giftings such as this that keep a smile plastered on my face. After all. what's better than finding a card you've been chasing for years just show up in your mailbox? Happy almost 2017, everybody! Or, as you might prefer it, happy 2016 is almost over, everybody! Admittedly, the Robin Roberts page was purely and instance of serendipity. Nothing more. I'm glad the Lowdermilk card was a hit! Oh, and I agree with you. I would take TriStar Obak over A&G, Gypsy Queen, Archives and any of those other sets that feature retired players. I actually got my first Rizzo autograph out of TriStar Obak, but it was 2009 at the time so I didn't know who he was. Seven years later and it's one of my favorite pulls ever.